Here is a concise and useful (I hope!) briefing by EVALSDGs on the value proposition of evaluation for the SDG era. In my previous post I highlighted the first “Call to Action” that flowed from my analysis of lessons for the global evaluation community based on MDG experiences. The first lesson that we learned was no surprise: influential individuals and organisations – in government, civil society and the private sector – have yet to discover and believe in the full value proposition of evaluation. Of course we need to prove the value and worth of our profession. But we also need to be much clearer and sharper in articulating our value for multiple purposes. This is something I also discussed in another blog post on the topic. I am a member of a small writing group established by EVALSDGs, an international network that is part of the global EvalPartners initiative. EVALSDGs consists of interested and skilled policymakers, institutions and practitioners who advocate for evaluation of the SDGs and support the integration of evaluation into national, regional and global SDG feedback and review systems. 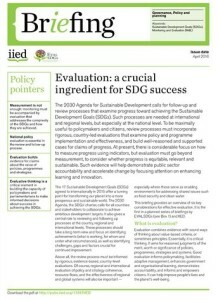 Our first briefing paper, Evaluation: a crucial ingredient for SDG success, done in collaboration with IIED, is now available. It highlights evaluation’s niche within what I call the “triple helix” sources of evidence, i.e. monitoring, research and evaluation, and gives some of the main reasons why it should be a strong part not only of the formal SDG Follow-up and Review process, but of development efforts at national level. I urge you to read and share it with government and other influential contacts who might be grappling with why evaluation should be seen as important for development or for the SDG processes specifically. It is, of course, also good reading for all of us who sometimes have to defend the role and (at least potential) value-added of evaluation, and of being an evaluator.